Will Eurobonds save us? The EU will be looking at a firm proposal to create Eurobonds later this year but Germany and France are dead against the idea. But are Eurobonds the only way to stave off a complete collapse of the Eurozone? Olli Rehn, the European Commissioner for Economic and Monetary Affairs, has confirmed that the EU is considering drafting a proposal relating to the creation of Eurobonds and is compiling a feasibility study on their potential effectiveness. The peripheral European countries: Portugal, Ireland, Italy, Greece and Spain are strongly in favour of the creation of “Eurobonds” but both Germany and France have categorically stated that they are absolutely against the idea. 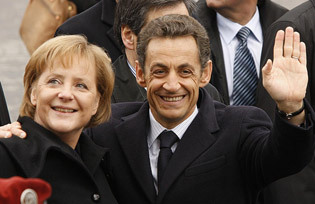 Angela Merkel and Nicolas Sarkozy have both good financial and political reasons for dismissing the project. The financial objection is that Eurobonds would instantly remove the incentive of profligate countries to behave themselves in economic terms. Why would they consign themselves to years of austerity if they could hide behind Franco-German skirts. The political reasons are that both Merkel and Sarkozy are on shaky political ground domestically. Sarkozy is highly unpopular with French voters and Merkel is considered by many not to be the woman for the job of getting Germany’s and the EU’s finances back on the straight and narrow. It could well be that both Merkel and Sarkozy are aware that the advent of Eurobonds is inevitable and the only way of staving off financial Armageddon and a total collapse of the Eurozone. But they will let Olli Rehn attract the flak for the moment while they pacify their voter base at home. So what would Eurobonds be exactly? The 17 country Euro zone would sell joint bonds to investors, guaranteeing them collectively. The money raised would be allocated according to the needs and requirements of member countries. And this is where the problems begin. This would allow troubled countries like Portugal and Greece to “mix” their debt with that of Germany which would act as the front man and guarantee the repayments but also proffer the shield of its AAA rating. Currently countries like Italy are paying 3% more than the Germans for their bonds as Italian bonds are seen as being somewhat unreliable. With the possible advent of the Eurobond there would be a sleight-of-hand or certainly a suspension of disbelief by investors who would choose to see only the German and French economies as representing the fundamentals of the Eurobonds. On an infrastructure level the combining of Eurozone debt would have one huge advantage however, as it would create a massive market for a single asset that would no longer require investors to go fishing about to choose between Spanish and French debt. A combined market would create a highly liquid bond market of more than €8 trillion. This would make it very hard to speculate against as it would require massive liquidity to do so. There is a problem though and that is the interest rate that a Eurobond would carry, a rate that would by definition be an average of the European rates. For Italy and Spain this would be a boon as it would shave a couple of percentage points off their repayment requirements but for Germany it would mean an increase in repayments, it has been suggested, of up to €47 billion annually . The Germans are once again being punished for their good housekeeping and this is going down very badly at home in the ballot boxes. What exactly is Germany getting in exchange for all this generosity and robust stability? In reality nothing, but the Germans are being terrified by the possibility of a Eurozone financial meltdown and the resulting collapse of the German economy (particularly German exports) so it is either pay up or die. Even George Soros is sounding the alarm, in an interview with Handelsblatt he stated that “Only Germany can reverse the dynamic of a European decay, Germany and other countries with a AAA rating have to approve some sort of euro-bond regime. Otherwise, the euro will implode.” It is persuasion by terror. ECB Executive Board member Juergen Stark also pointed out in a Handelsblatt interview that “Eurobonds – have been presented as a magic solution as a way out of the crisis but in reality, they would merely treat the symptoms and not the causes of the problem”. Even after the advent of Eurobonds, the massive debt of irresponsible countries will still exist. But what to do? It is clear that the ECB’s recent acquisition of unwanted Spanish and Italian debt is a temporary solution to keep the wolves from the door, but the situation cannot be sustained indefinitely. So some sort of a solution will have to be found. The ECB cannot just keep throwing the occasional piece of meat to those wolves of the financial markets. The European debt crisis is destabilising global markets and putting the brakes on global growth, someone has to come up with a solution, the problem is not going to go away of its own accord and the European economies are not in a position to “grow “ out of the crisis. Quite the opposite. The only thing on the plus side is that the markets are ready and primed for revolutionary measures, in fact they almost expect them, which gives the ECB greater room to manoeuvre. The European rescue fund is indeed a solution but the €450 billion guaranteed by Eurozone members is now seen as inadequate to deal with a “too big to fail” country like Italy. As well, France’s AAA rating is now under threat so a solution has to be found while the French economy is still perceived as sound. A German or a Greek Eurobond? So would Eurobonds turn the Eurozone into one big Germany or one big irresponsible Greece? Who would contaminate who? A proviso to prevent such a contamination has already been suggested which is to limit the exposure of Eurobonds to just 60% of gross national product. If a “profligate” government wanted to issue more then they would have to issue those bonds themselves. This would leave Italy in particular with a serious problem as the Italian national debt is currently running at 120% of GDP. Anything above the 60% limit would no doubt quickly become second rate Italian junk bonds with a massive interest rate. Many observers are saying that lawmakers are dancing around the main issue which is of course the fact that if the Eurozone is going to back your debts then the Eurozone will have to have a say in the fiscal policy of your country with a power of veto over profligate legislation. This would require a political unity that does not exist in the Eurozone. This would also irk voters who might find themselves in a situation of voting for a national political party that wants to fund massive infrastructure projects but which finds the project vetoed by EU mandarins. It looks like the EU is being bullied into a political unity that it does not want but it may have no choice: the dissolution of the Eurozone would be too catastrophic to contemplate. Having your fiscal policy dictated by Frankfurt may be a small price to pay.